The Kitchen's Patriotic Party kicks off with Jeff Mauro's GYOB ("Grind Your Own Beef") Short Rib Burger with Dijoli and new ways to Flavor Bomb condiments. 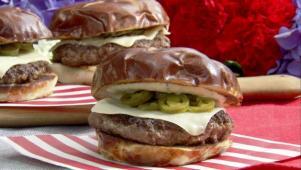 Katie Lee and Sunny Anderson take hot dogs to the next level, and lifestyle blogger Rachel Hollis joins the party with her Red, White, and Blue Pretzel Salad. The hosts also share No-Fail Party Prep ideas and a DIY Confetti Cannon to make the 4th of July truly great! 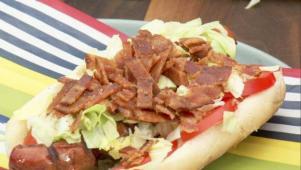 Sunny elevates a grilled hot dog with classic BLT toppings. Jeff creates the perfect burger blend by grinding beef short ribs. 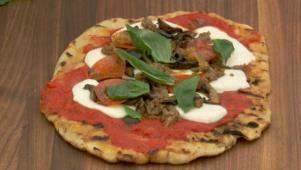 Katie Lee gets some help with her loaded up grilled pizza.